HomeStays are a wonderful way to get a full experience of the country in which you have chosen to travel. Each student is placed in the home of a local school family. The student then attends school with their new “sibling” to get an idea of what a day of school is like in their country. Most meals will be eaten with the host family as they all learn about each other’s countries and way of life. Visiting Students will enjoy everyday activities with their new family, and possibly a short weekend excursion that highlights the local area. There will also be additional full day group excursions that have been pre-scheduled with your travel leader and Customized Student Tours, LLC. Who can volunteer to be a host home? Are there requirements for hosting an exchange student? Yes. The host family must have a caring environment; provide a dedicated bed and 3 meals each day. Do I need to complete a host family application? Yes. We will either take this information from you over the phone or have you complete it during your host family visit. What if my house is small or I live in an apartment? The size or type of home does not matter. You just need to have a loving home with a separate bed for the exchange student to sleep. The home needs to be clean and have a warm, nurturing environment. Are host family home visits done? Yes. We make arrangements with each host family to visit your home, meet your family and also get a tour of the home. The visit takes approximately 15 – 30 minutes. How many exchange students can I host? Unless it’s a special circumstance we only place one exchange student in each host home. Can host families choose to host either a boy or girl? Students are most often placed with host students of the same gender. However, we understand that there can be extenuating circumstances and Customized Student Tours, LLC will always provide the best possible match for both the host and exchange students. Can the exchange student sleep in the same room as my student? Yes, as long as the exchange student has his or her own bed. Will we have the opportunity to communicate with our exchange student before they arrive? Yes. We will provide the contact information that is supplied to us by the parents. Usually an email address, Skype or any social media platforms. We also supply the exchange student with contact information for the host families, so don’t be surprised if they contact you first. How will I know what other families are hosting exchange students? We will arrange a mandatory host family orientation meeting at the school where we will discuss the program in more detail and offer a question and answer session. This is a great opportunity to meet and get to know the other host families. Is there additional information distributed during this meeting? Yes. We will distribute host family packets that include important information. Examples would be a Host Family Roster, Phone Chain and the Student’s Itinerary. The meeting usually takes one hour and is held in a school library. Do I get a stipend for hosting an exchange student? No. We believe that you should only host if you are interested in this amazing experience for the students. The satisfaction your family will get from hosting a child from another culture and country will last a lifetime. Where are the exchange students typically from? The countries our exchange students come from are constantly expanding, but they are typically from France, Italy, Spain, Germany, Scotland or Canada. How old are the exchange students? The students may range from 13 – 18 years old. Do the exchange students speak English? They have all taken English language classes, but their skill level will vary from child to child. Do the students have insurance and their own money? Yes. The students have insurance and their own spending money. If our exchange student does not speak good English how will my family communicate with him/her? We always recommend trying to communicate with each other by being patient and using basic English language (please don’t yell, it doesn’t help). One possibility is using the Internet to translate. You will find as each day goes by it gets easier to communicate as the students feel more comfortable. What are the Internet sites you recommend for translation? Two good ones are Google Translate and Babbel Fish. What will the students do during their stay? They will attend school for approximately 2-3 days with your child, go on full day bus excursions, and spend evenings and weekends with their host family. Will they take the bus with my child? Each individual school will determine whether busing is feasible. If a school decides the students cannot take the bus, the host parent, or a child that is 18 years old, will have to drive them or Customized Student Tours, LLC can assist in arranging car-pooling. What if my child participates in after school activities? We pair each student with similar interests and encourage the exchange student to participate in those activities if possible. If there is an activity night or dance the exchange student will need to sign up during the day in the school’s main office as a guest. What do the exchange students do on the weekdays they are not in school? 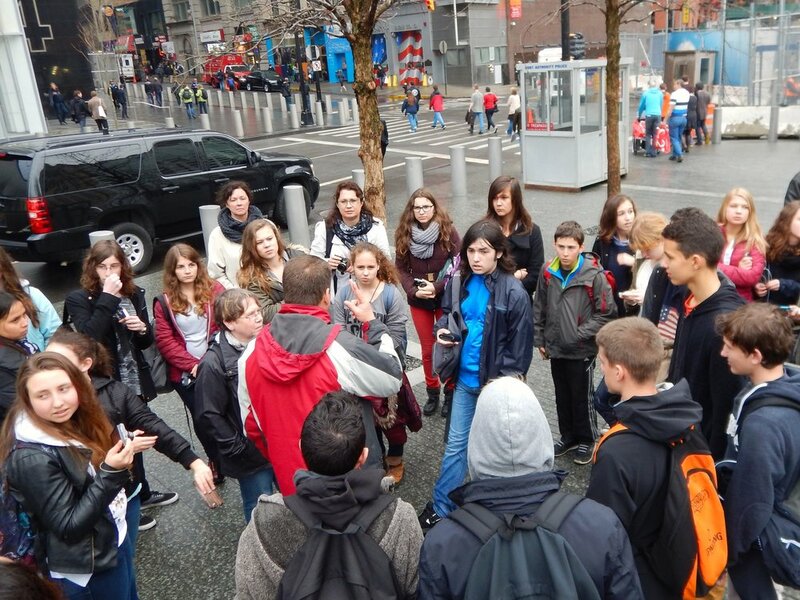 Whether the exchange students will be participating in school or leaving for one of the various excursions, all activities will begin at the host school. Do I need to pick them up after the excursions? Yes, you will need to come to the school and pick up your exchange student. Please refer to the trip itinerary for approximate time. We will have phone chains in place to let you know when we expect to arrive. You are free to plan whatever you want on the weekends with your exchange student. You are not obligated to do anything special, but most host families take advantage of the weekends to take the host student to special events or places. What if my exchange student wants to do something that I don’t want to do? You are in charge while the student stays with you. You have the final say. Enforce the same rules you have for your own child of the same age. Do I pick up the student at the airport? No. Customized Student Tours, LLC will arrange bus transportation to and from the airport. Where do we meet our exchange student when they arrive? Customized Student Tours, LLC will arrange a meeting place where the exchange students will be introduced to their host families. This location will most likely be at a local school. How do we know which exchange student is ours? We recommend making a welcome sign that has your exchange student’s name on it. However we will be present to be certain all students and families are correctly matched. How do I make my exchange student feel at ease when we first meet? They will be nervous, tired and hungry. Greet them with a big smile and welcome them to your family. A hug is fine. Be sure to have their bed ready and a small meal prepared when they arrive at your home. We have discovered that most foreign students LOVE pizza! Also, introduce all family members when you get home. In the morning, introduce them again. What should I expect when they leave for home? Expect some emotions. Relationships will be forged during their stay and it’s sad to see them leave. Don’t be surprised if there are tears and lots of hugs. It’s common for the exchange student to talk about having your child come stay with them in their country. When they say it, they mean it. Most of the time the children continue to stay in touch via social media. Some parents forge friendships with the student’s parents as well via Facebook, Skype and email. Will my child have the opportunity for a reciprocal exchange? Absolutely. Please contact us for further information.